US President Donald Trump's decision to officially recognize Jerusalem as the Israeli capital could take the region "backwards to even darker times", the EU's diplomatic chief warned on Thursday. "President Trump's announcement on Jerusalem has a very worrying potential impact. It is a very fragile context and the announcement has the potential to send us backwards to even darker times than the ones we're already living in," Federica Mogherini told a press conference in Brussels. The EU, along with other major international powers, has repeatedly voiced deep concern this week about Trump's declaration, which upended seven decades of US ambiguity. Trump's announcement sparked a general strike in the Palestinian Authority and a call for a new "intifada" or "holy war" from Hamas. The Israeli military deployed hundreds of more troops Judea and Samaria in preparation for security disturbances. The EU has long supported a two-state solution and Mogherini said the 28-member bloc would keep working with both Israel and the Palestinian Authority - as well as regional players such as Egypt and Jordan - to restart direct talks. 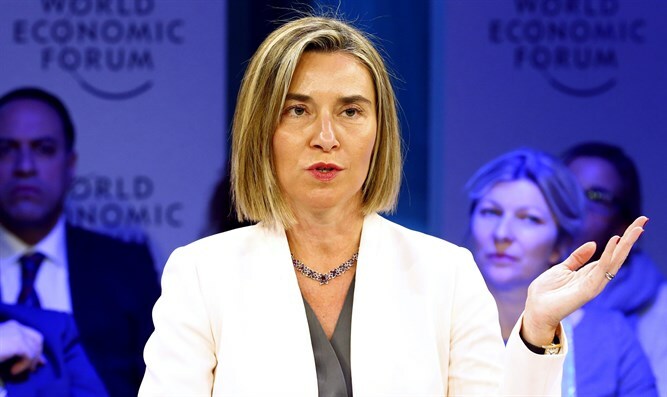 Mogherini, who meets Jordanian Foreign Minister Ayman Safadi in Brussels on Friday and Israeli Prime Minister Binyamin Netanyahu on Monday, called for cool heads, saying demonstrations against the decision should be peaceful. "What we truly need in these difficult times is wisdom and to listen to the wise voices calling for peace and peaceful reactions," Mogherini said. "We believe this difficult moment calls for an even stronger engagement for peace. The most urgent priority now is that all relevant actors avoid further escalating tensions on the ground," she added. Netanyahu's visit, which is to include an "informal" breakfast with EU foreign ministers, was planned before Trump's announcement, but the Jerusalem issue is now set to dominate the meeting. British foreign minister Boris Johnson said Trump's decision made it all the more urgent that what he called "the long-awaited American proposals on the Middle East peace process" were brought forward. In recent months Trump's son-in-law and senior adviser Jared Kushner has been working with a small team to develop a new US proposal to revive peace talks between Israel and the Palestinian Authority. But a senior EU official said that despite close contact with Washington on the matter, "we have not seen elements of a plan for the moment."